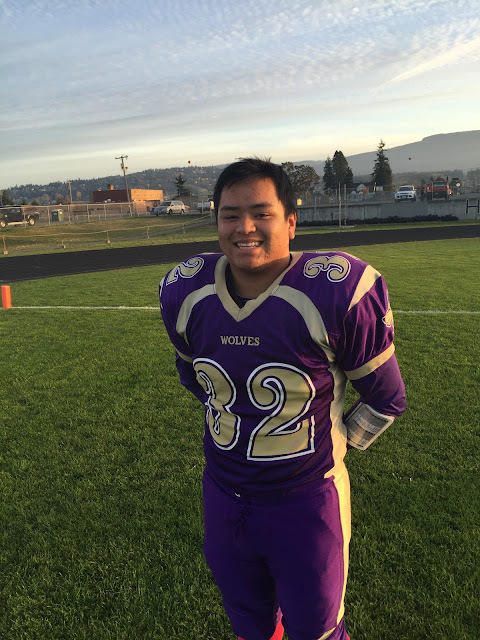 (Sequim) -- Senior fullback Geordyn Shinard scored four touchdowns as the Olympic Trojans powered to a 48-7 romp over the Sequim High Wolves Friday. Shinard, a 5-foot-10, 215-pound bruiser, rushed 16 times for 131 yards, visiting the Sequim end zone 3 times on rushing scores and catching one of 3 touchdown passes thrown by Olympic senior quarterback Matt Becker. 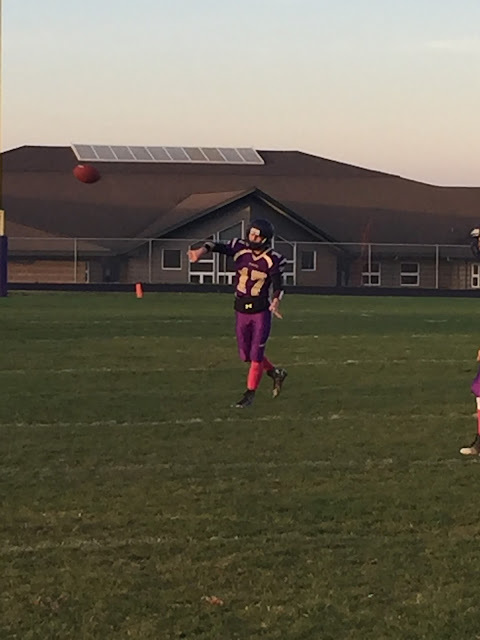 Becker was 8-for-8 in the passing department for 122 yards, while carrying 13 times for 156 yards and a TD, plus a 2-point conversion run. 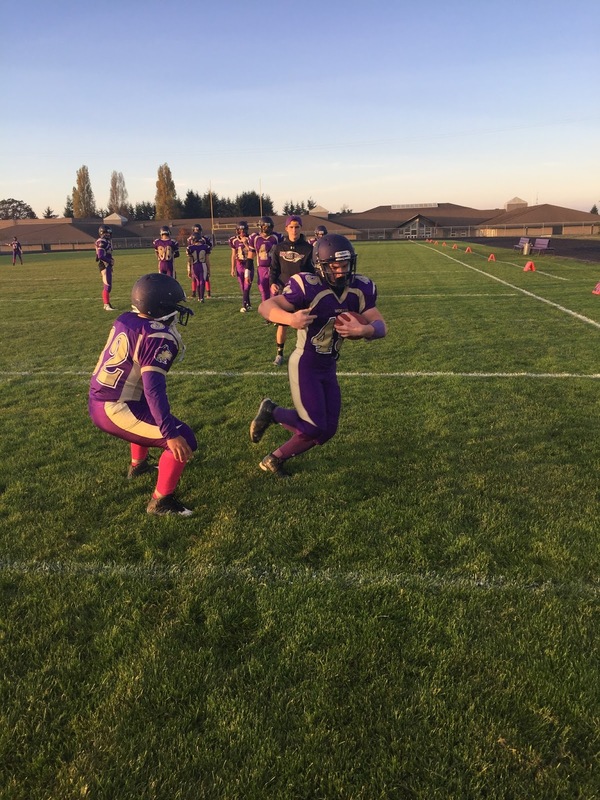 Olympic -- the state's 7th-ranked 2A team -- improved to 8-0 overall and 5-0 in Olympic League play, setting up a showdown for the league championship at Silverdale Stadium next Friday against the North Kitsap Vikings, a 48-6 winner over Port Angeles. Olympic led 29-0 at halftime and scored the first 36 points of the game before Sequim tallied on a 13-play, 70-yard drive with a 10-yard touchdown pass from Riley Cowan to Gavin Velarde with 4:19 left in the third period. The duo teamed up for a 41-yard gain on the scoring drive that converted a 3rd-and-16 from the Wolves 24. Cowan completed 9 of his 23 passes for 112 yards, a TD and an interception. Velarde had 5 catches for 76 yards and a score. The Trojans got two more touchdowns in the final period, the last on a Shinard 8-yard run with 6:14 remaining that triggered the running clock. Olympic's offensive line opened huge holes for the running game and ample passing time for the elusive Becker. The Trojans' advantage in total yards was 461-190, including 339-78 in rushing yardage. Arnold Black had 45 yards on 10 carries for Sequim and Mark Feeney added 40 yards on 3 carries. Friday's contest was the last home game for 23 Sequim football players, including Ian Dennis, Noah Christiansen, Thomas Winfield, Ben Hughes, Ethan Richmond, Nick Faunce, Michael Shimer, Nick Tucker, Kane Stoddard, Arnold Black, Brandon Stamper, Mark Feeney, Dillan Smith, Chris Whitaker, Alec Holland, Jack Ellison, Matthew Schock, Nathan Allison, Sebastian Goettling, Zach Hebert, Jason Springer and Ty Jones. 5 senior cheerleaders had their final home football game, including Alysha Graham, Morgan King, Amanda Sanders, Allie Bean and Kyla Rigg. Sequim dropped to 5-2 overall and 3-2 in league action and will play next Thursday at Bremerton, a 44-0 winner over North Mason. The Wolves will likely have a pigtail game Tuesday, November 3rd at North Kitsap against the third-place team from the Seamount League. 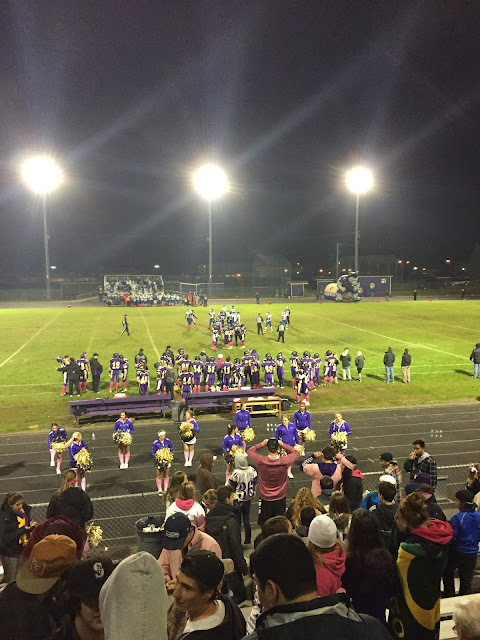 In other games Friday involving Olympic League teams, Klahowya beat Coupeville 41-15, Port Townsend ripped Chimacum 63-12 and Mountlake Terrace beat Kingston 23-20 in a non-leaguer. Key play: Sequim turnover on downs at Olympic 49. 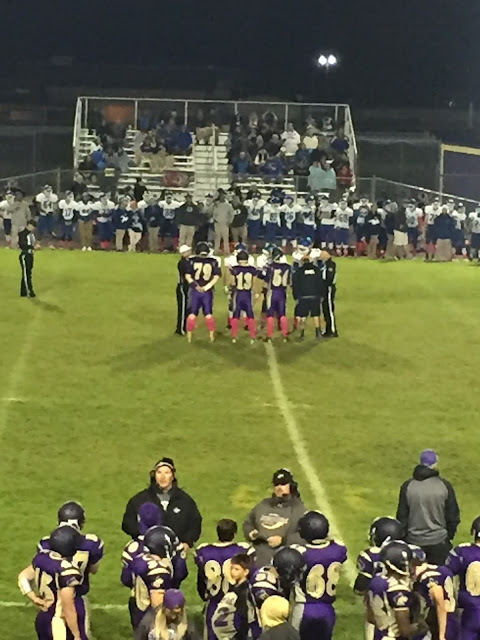 Key play: Becker 65 yard scramble to Sequim 10 on 3rd and 20. 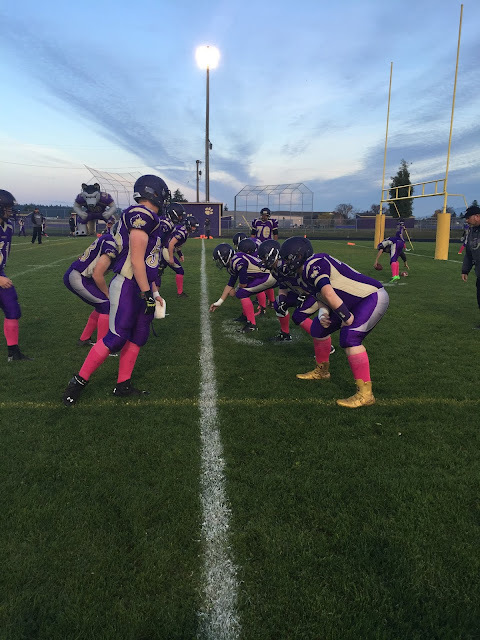 Key play: Sequim TOD on fake punt, Velarde gained 10 on 4th and 19. Key play: 41 yard pass from Cowan to Velarde to Oly 35. 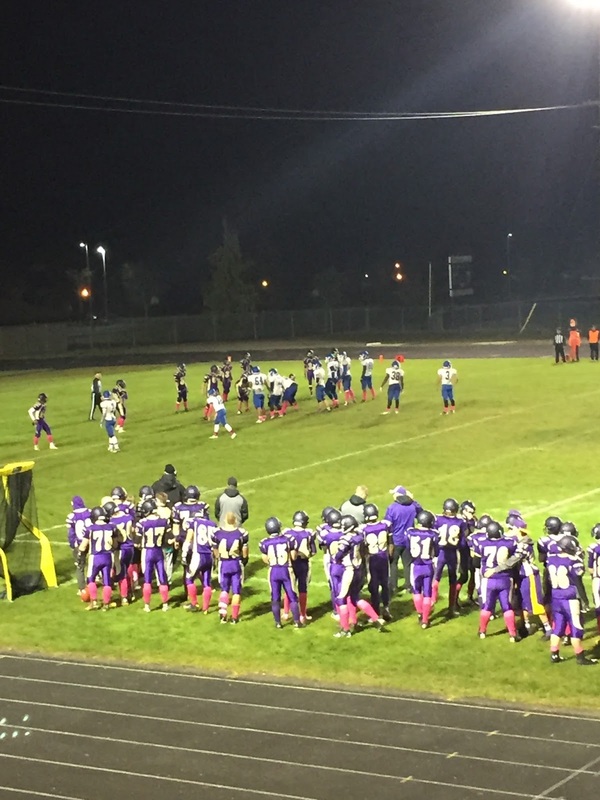 Key play: Shinard 20 yard run to Sequim 9. Oly -- Matt Becker 13-156-1TD, Logan Madison 11-35, Jaden Fernandez 3-17, Geordyn Shinard 16-131-3TD. Seq -- Riley Cowan 7-(-20), Gavin Velarde 6-13, Arnold Black 10-45, Mark Feeney 3-40. 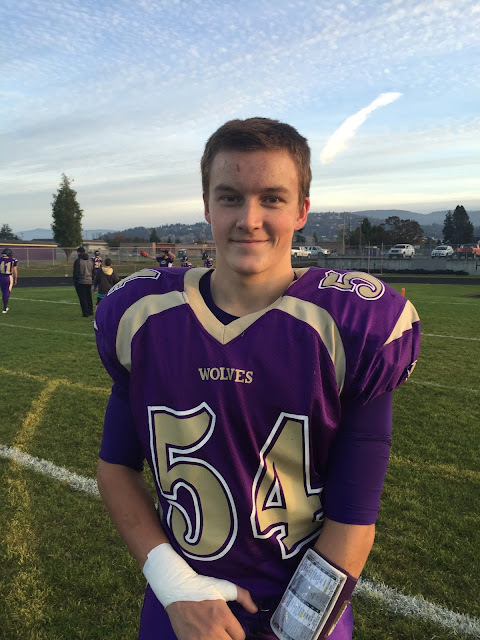 Oly -- Matt Becker 8-8, 122 yards, 3TD, 0INT. Seq -- Riley Cowan 9-23, 112 yards, 1TD, 1INT. Oly -- Ethan Goldizen 1-20, Colton Wade 5-64-2TD, Geordyn Shinard 1-11-1TD, Taleeke Davie 1-27. Seq -- Ian Dennis 3-29, Gavin Velarde 5-76-1TD, Rudy Whitehead 1-7. Oly -- 43 carries, 339 yards, 4TD. Seq -- 26 carries, 78 yards. 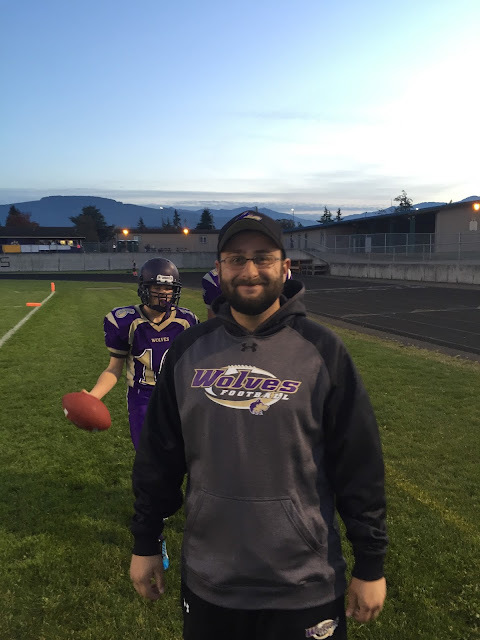 Oly -- 8-8 (100%), 122 yards, 3TD, 0INT. 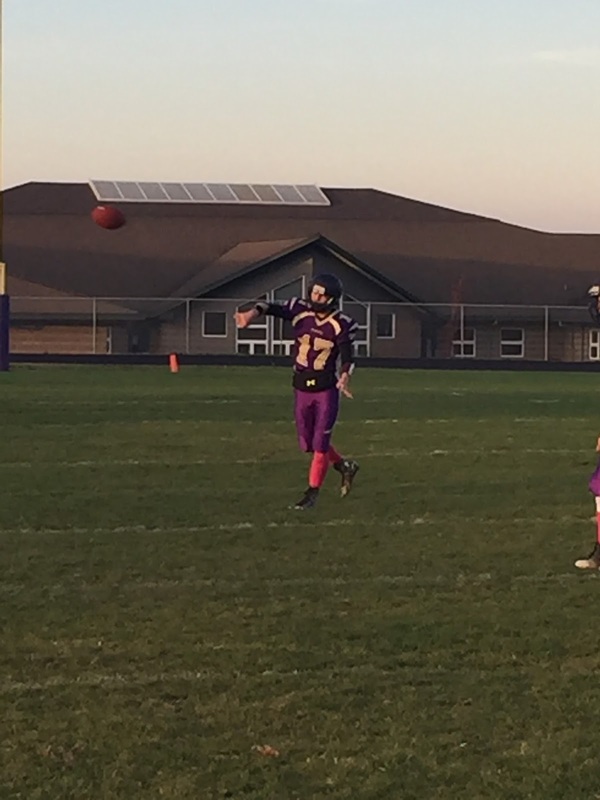 Seq -- 9-23 (39%), 112 yards, 1TD, 1INT.